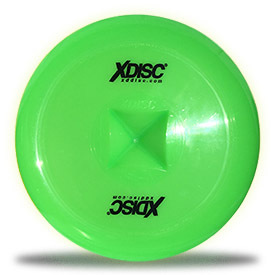 The original XDISC in Ancient Alien Green. 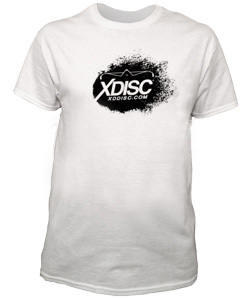 XDISC is the worlds most versatile flying disc. A patented gull-wing profile provides super accurate and stable flight even at low-speed. The XDISC's superior aerodynamic design makes it simple for beginners of all ages, and the concave flight plate allows for a more natural grip and throwing position. 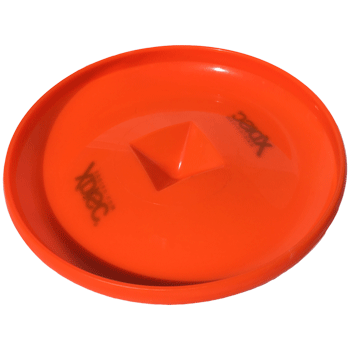 Not only is it easier and more comfortable than a traditional flying disc, the center pyramid allows tricks and spins to be performed! The trick possibilities are endless and the sky is the limit. XDISC shatters the status-quo, traditional ﬂat ﬂying disc design concept in both form and function. The features listed here help show the magnitude of change created by the central pyramid, dished ﬂight-plate, and the advanced aerodynamics built into XDISC's design. 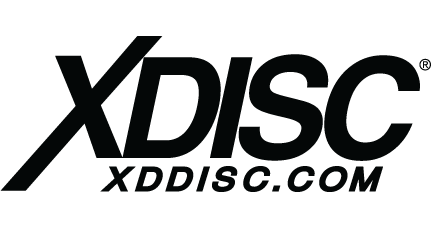 XDISC is the direct descendant of early versions of the concept, PYRA-DISC and STARDISC (see Origins). Now, with XDISC, all the elements of the paradigm shift initiated with it’s earlier version have been reﬁned and perfected for ﬂying and gaming perfection. 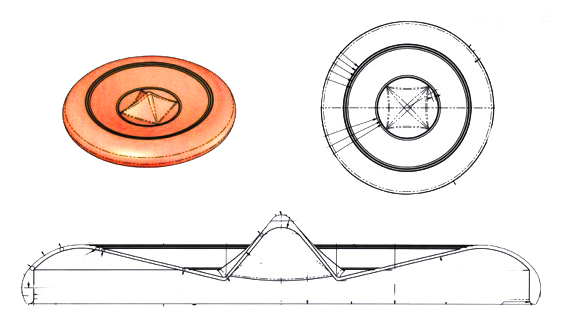 Because of XDISC’s evolutionary shape, the aerodynamic property known as the Coanda Effect occurs. This helps beginners get good ﬂight and improves performance. Spin it upside down on its point like a top and it will balance on almost anything! 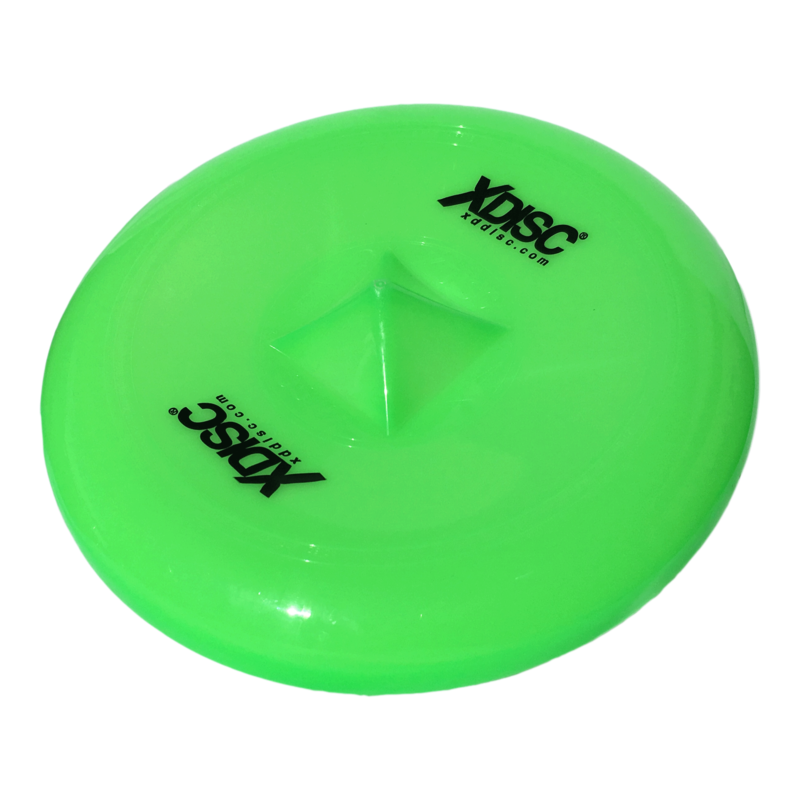 All XDISC tricks and moves are made possible by it’s gyroscopic properties. Many advanced tricks work by upsetting the gyro stability, letting gamers do amazing turn-overs and other brand-new tricks. The pyramid acts like a rudder, creating two equal airﬂows on either side, noticeably stabilizing XDISC’s ﬂying characteristics. 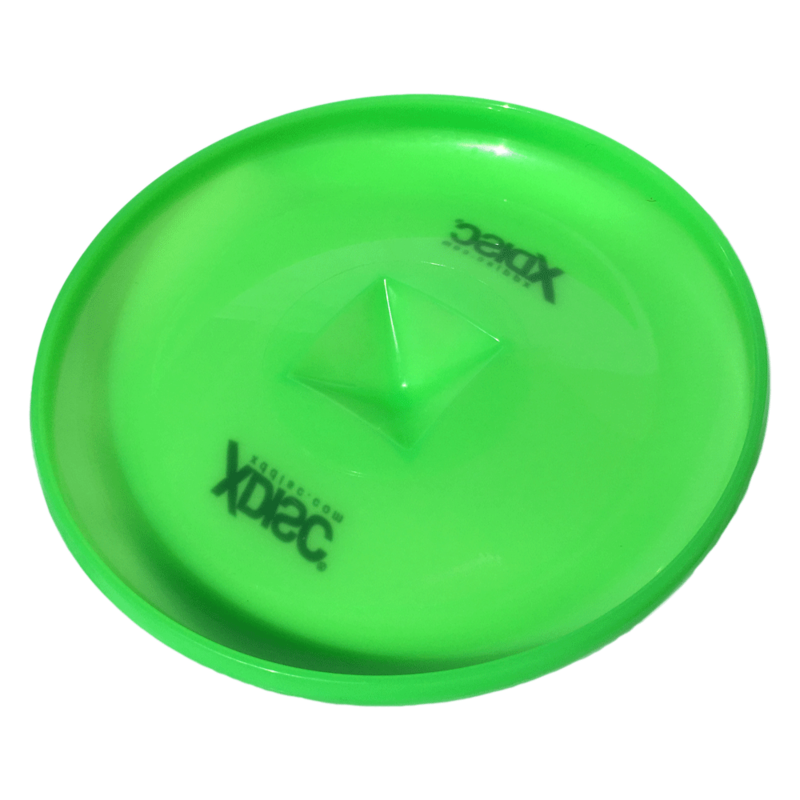 The structural strength of the four-sided center pyramid enables XDISC to resist "taco-ing" during launch. 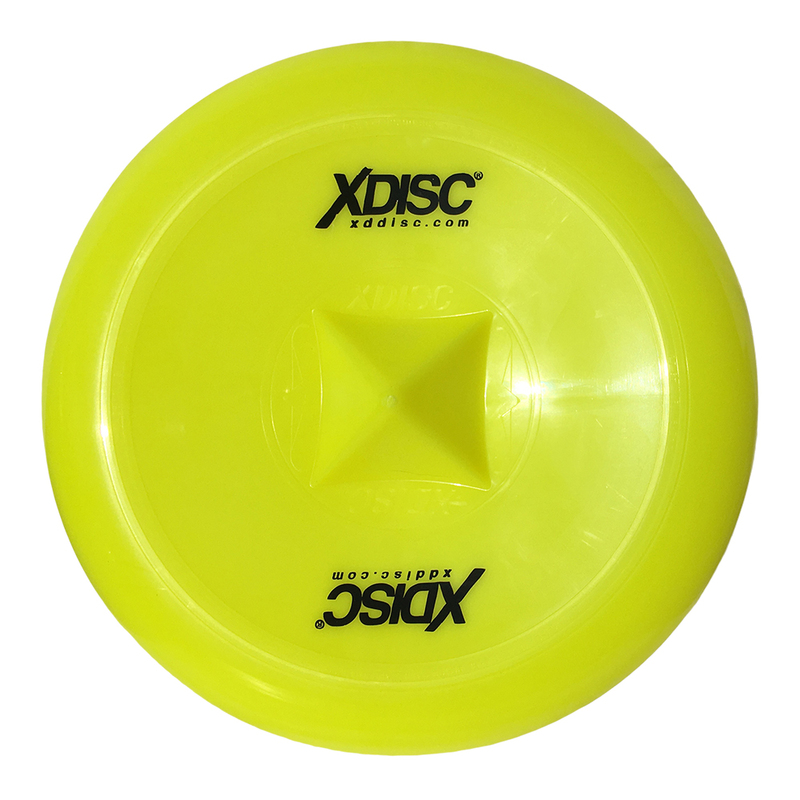 XDISC also features a proprietary performance-tuned wall thickness for a balance of strength and weight. The trick deck is specially designed for advanced XDISC moves and is the smooth circular area between the outer and inner rings of XDISC. XDISC’s concave ﬂight-plate and four-sided pyramid provide many improvements over ﬂat disc aerodynamics, but there’s even more design elements that make XDISC unique. Advanced rim-ratios, variable-tuned wall thicknesses, and no ejector-ring scarring are all exclusive XDISC improvements that provide a better gaming and ﬂying experience for everyone. Join the Club to receive special updates, compete in competitions, and learn sweet tricks!